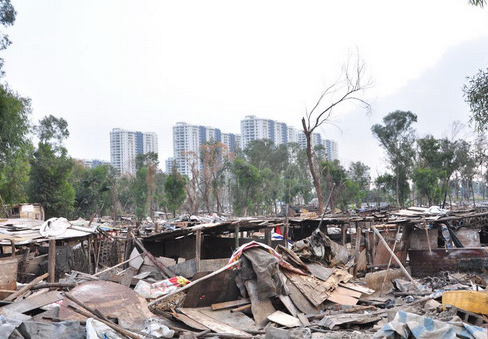 According to the press reference held on Feb. 21, with a document titled "The Survey on the Removal of the Biggest Shanty Town in Sanya", the Sanya Government claimed that more than one million yuan has been distributed as compensation to pig farmers living in the illegal shanty towns in the city, reports Hainan.net. The government spokesman said the pig raising shanty areas are illegal occupied constructions that do not meet authorized conditions of compensation. However, considering the demolition of shanty towns left no place to raise those pigs, the government has offered certain subsidies to pig farmers to cover their basic living income. At present, 214 pig farmers can receive the subsidies and each one can be given 5,457 yuan. From last September till now, the Comprehensive Enforcement Bureau of Sanya and relevant departments have released the notice several times to inform the villagers of demolition of the clusters. Currently, a number of villagers are moving out of the shanty areas within the limited time, but some pig farmers refuse to move out and temporarily transported little pigs from markets and are hoping to get higher compensation.